When you buy a four-wheel drive you really want to get the most out of it, both on and off the road and that means choosing the right tyres for your particular vehicle. Toyo Tyres offer the Toyo OPAT - Open Country All Terrain – designed to deliver high levels of traction and refinement on sealed roads and deliver high performance off road. There’s an OPAT to suit most four-wheel drives and light trucks. The passenger construction gives a smooth ride and the light truck construction is rugged enough for the roughest dirt road. Toyo OPAT tyres give you sharp steering and low tread noise on normal roads along with great traction on unsealed surfaces. 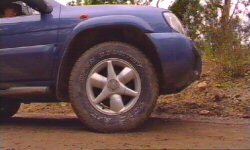 For all those off road trips the OPAT tyres will give even better grip in muddy situations and the tread pattern is self-cleaning. 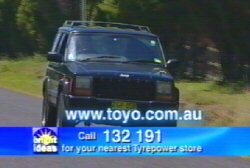 Tyrepower have been helping Aussies for 25 years and with over 230 stores around the country, you’ll find a Tyrepower Store to look after you wherever you go in Australia. They are Australia’s largest independent retailer of tyres. They are a co-operative group owned by the store owner/operators. So Tyrepower truly is the place "Where the man that owns the store runs the store”. So when it’s time for you to buy new tyres get into a store you can trust. Steer your light truck or 4WD to your nearest Tyrepower store.